The MDX FirstSibling function will return the First Child member that belongs to the parent of a specified member. For example, If you know single customer name and you want to find the Sales of a first customer then you can use this FirstSibling function. In this example we are going to find the First Children present in the Countries list. Below line of code will check for the France parent (Which is All member) and then finds the first child member of the Country. If we know the Loiret is one of the state in France and our intention is to find the first state present in France then, we can use this FirstSibling function. 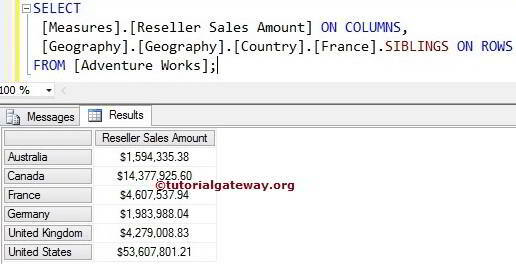 In this example we are going to find the First Children present in the State Province list and calculate the Reseller Sales Amount of that. Below line of code will check for the Loiret parent (Which is France) and then finds the first child member of the France Country. 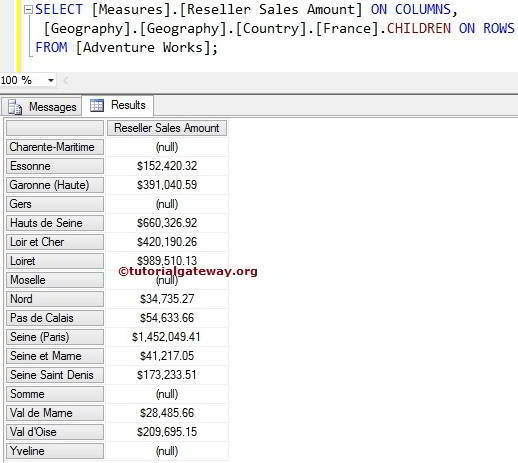 For Charente-Maritime State, there is no sales at all so, it is displaying Null results. In this example we are going to use the FirstSibling function alternative to achieve the same result. Please refer MDX Parent Function to understand the Parent function and refer MDX FirstChild function to understand the FirstChild function.